The 3 Little Pigs sing happily together before the Big Bad Wolf arrives in the College of Charleston Opera production of Mozart’s music arranged for children. The College of Charleston Opera Program, directed by Professor David Templeton, features voice majors who stage operas and musical revues for the public. In addition, the Opera Program infuses the arts and an appreciation of opera into local schools. Over the past seven years, they have performed over 100 performances of children’s stories such as Billy Goats Gruff, which addresses bullying, and Little Red Riding Hood, which addresses lying and not talking to strangers. By the end of spring 2016, the Opera Program had reached more than 40,000 students, many of whom attend underserved schools in local communities. The Opera Program’s children’s opera initiative receives funding from Arts, etc., an organization of Kiawah and Cassique women committed to supporting the arts. The group’s main fundraiser is the acclaimed Kiawah Art & House Tour, which raised over $80,000 last year. The 2017 Tour will take place on Friday, April 7. Tickets are currently for sale and proceeds will benefit the College’s Opera Program and other arts opportunities for children. 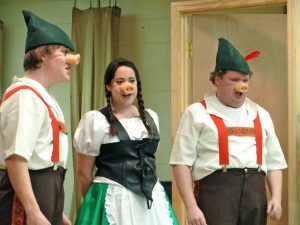 A public performance of this year’s children’s opera, “The Three Little Pigs,” will be presented as part of the Piccolo Spoleto Festival on Tuesday, May 30, 2017, at the Charleston Public Library (Downtown). To learn more about events by the Opera Program and other College of Charleston School of the Arts events, view the 2017 spring calendar of concerts, theatre and dance performances, exhibits, scholarly lectures, and much more. Also, follow the School on Instagram, Facebook or Twitter.